When my husband and I moved into our new house a couple years ago, we took a big risk. Our tiny neighborhood of ten lots was brand new (a developer had purchased one huge lot and subdivided it into a neighborhood of ten lots). Only four houses were built at the time, and there were no residents yet. We loved the house. And we loved the idea of a small, cozy neighborhood on a quiet cul-de-sac. But we had some concerns. What if all our neighbors turned out to be assholes? What if they were grumpy old curmudgeons who insisted on bickering constantly over boundary lines? What if we hated them all? In the end, we took a leap of faith and bought the house. And, now that all ten houses have been built and occupied, we realize that we got very lucky. We know and like all of our neighbors (in fact, several neighbors have become really good friends). We have annual neighborhood block parties and progressive dinner parties. We go to brunch and lunch and yoga together. We have a happy little community plucked from a bygone era. And we love it. Ove glares out the window. The poser is jogging. Not that Ove is provoked by jogging. Not at all. Ove couldn’t give a damn about people jogging. What he can’t understand is why they have to make such a big thing of it. With those smug smiles on their faces, as if they were out there curing pulmonary emphysema. Either they walk fast or they run slowly, that’s what joggers do. It’s a forty-year-old man’s way of telling the world that he can’t do anything right. Is it really necessary to dress up as a fourteen-year-old Romanian gymnast in order to be able to do it? Or the Olympic tobogganing team? Just because one shuffles aimlessly around the block for three quarters of an hour? Even smiles can set him off (“The husband just nods back at her with an indescribably harmonious smile. The very sort of smile that makes decent folk want to slap Buddhist monks in the face.”). But, when you get right down to it, Ove has many reasons to be grumpy. His wife, Sonja, the one person he loved in the world, died six months ago. And now he’s been forced into early retirement. He feels lonely and purposeless and unhappy. So, he decides to take matters into his own hands . . . and kill himself. Unfortunately, his plans are repeatedly thwarted by his God-awful neighbors. A new family (which consists of the Lanky One, the foreign Pregnant One, a seven-year-old introvert, and a three-year-old “flapping speech defect”) moves into one of the neighboring houses and inserts themselves into Ove’s life, demanding his aid and attention at every turn. And, to make matters worse, an ugly Cat Annoyance has showed up in the snow outside Ove’s shed, requiring food and warmth. Things are not going as Ove intended. This book is cutesy and utterly predictable. 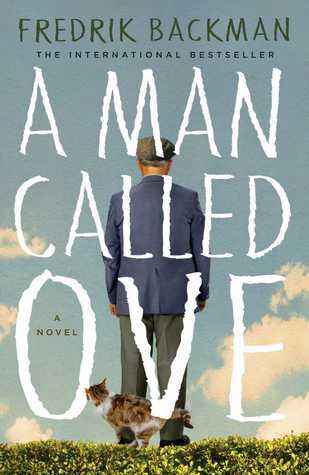 Each chapter is entitled “A Man Called Ove . . .” or “A Man Who Was Ove . . .” (for example, “A Man Called Ove Drills a Hole for a Hook,” and “A Man Who Was Ove and a Woman on a Train”). And, as you would expect, it follows the evolution of the man named Ove. It shows how he got to be the way he is, how he is more complex than his curmudgeonly façade, and how his hard exterior shell can be cracked. It reads quickly (lots of short chapters, lots of silly little adventures), is laugh-out-loud funny in places, and is shed-actual-tears touching in others (I had tears streaming down my face at the end. I blame pregnancy hormones). It is not particularly deep or thought-provoking, but it is sweet, it has a lovely message, and it will make you smile. It will also make you want to read his new book, released a couple weeks ago, My Grandmother Asked Me to Tell You She’s Sorry. The review for that book is coming up next! Who should read it: Mom (i.e., people who love a sweet, cutesy book), my Park Overlook neighbors (i.e., people who appreciate great neighbors and happy communities). This entry was posted in Rating: 3.5/5 and tagged A Man Called Ove, Book review, Book Reviews, Books, Fredrik Backman. Bookmark the permalink. I loved this little book! I’m looking forward to reading the follow up but I already know that there’s no way it can live up to my love for the original. Also, your neighbourhood sounds amazing! Your instincts are correct–his new book is not as good as this one. That said, it is still cute, enjoyable, and worth reading. I’ll post my review on Monday or Tuesday! It is amazing! We are very lucky!! Sounds good–I need a book for the plane! This would be a perfect plane book for you! You should download it immediately.